It's been quite a while since my last skin care post, so I'll give you a little update on my skin situation first. I have dry/acne-prone skin - especially around my chin area. My skin became so painful & generally caused me a lot of discomfort (mostly appearance-wise) with day-to-day activities that I resorted to paying another visit to the doctors. Last year, I was on Erythromycin tablets for nine months - as well as being an antibiotic often prescribed for infections, it is also commonly used to help reduce acne. It really helped me a lot last year, and since coming off the tablets around September time, my skin flared up again. I paid another visit to the doctors last month and have been prescribed Erythromycin again for a further six months - it's only been a month since I started taking them again & my skin has cleared up dramatically. Along with taking tablets twice daily, I have to pay serious attention to my skincare routine. I virtually swear by Clinique's Clarifying Lotion. I sweep this over my face/neck with a cotton wool pad in the morning & evening every day. It's the only product of this kind that works for me. After trying the Clean & Clear Deep Cleansing Lotion years ago, I've been so reluctant to putting strong products on my skin - the alcohol in Clean & Clear used to practically burn my skin, leaving it very red & irritated. However, with Clinique, I've never had any irritation. You can certainly feel the lotion doing its job - you can instantly feel the cool sensation on your skin, but it's in a positive way! It actually feels like it is helping to clean your skin. The Clarifying Lotion is part of Clinique's '3-step Skin Care System', however, this is the only product I own from the range. I personally prefer to use the lotion once in the morning, prior to applying my Benefit Triple Performing Facial Emulsion to give my skin even more moisture (mine really needs it!). In the evenings, I remove my makeup with Simple wipes, which I know may be a bit of a 'sin' to some, but it works for me. I use the Clarifying Lotion after to get rid of any excess makeup that the wipes haven't removed - you'd really be surprised by the results & how much makeup comes off on the cotton wool pad! 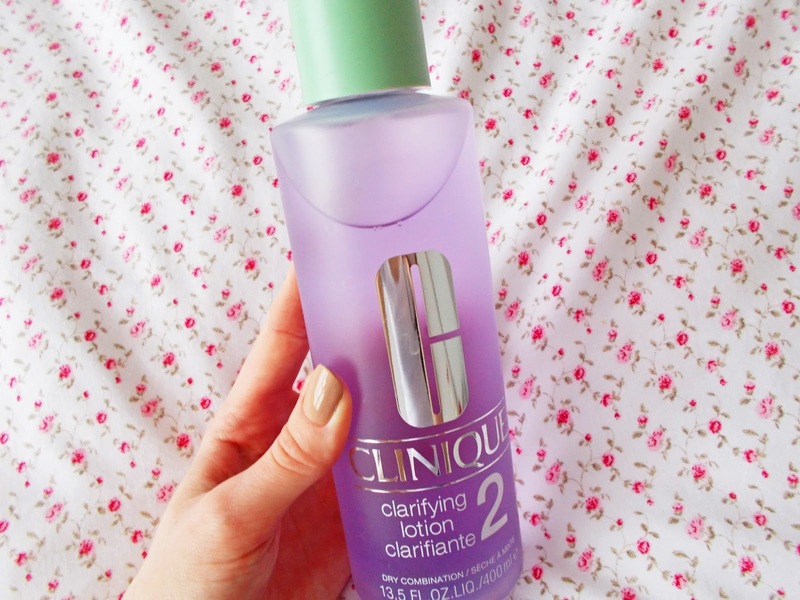 I really do think the Clinique Clarifying Lotion is excellent. I personally have had no negative reactions to this & it is simply aiding to help clear my skin of the acne. It is a pretty steep price at £16.00 for a 200ml bottle (and it is very easy to over-pour the product due to the bottle & lid design - as opposed to a dispenser) but I choose to invest in the 400ml bottle for £25.00. It does hurt having to pay so much for the bottle, but I know my skin appreciates it in the long-run. I was so impressed with the Clinique cleanser that I used all up that I would definitely purchase from their skincare range again. This sounds brilliant.